So exactly what is it that makes pakicetus a whale? Well, it’s not its internal organs or its behavior. The pakicetus is only known from fossil remains of its bones. They don’t have any internal organs or behaviors to observe. So it’s classification as a whale is not based on internal anatomy or behavior. The whales most of us are familiar with have a lot of adaptations, internal and external, suited for a fully aquatic lifestyle. The ones we easily recognize are adaptations such as fins, tail flukes and blowholes to name a few. We might think that an organism needs these traits to be classified as a whale. But the pakicetus didn’t have any of these things, so we’d be wrong. Whales then must not necessarily have features like a blowhole or tail fluke. The tail, legs, feet, spine, nostrils and ears of the pakicetus were also designed for terrestrial living. So, none of these features make it a whale. One thing that evolutionists make note of is that the density of its leg bones would have allowed it to wade in shallow water without floating out with the tide. But it may have longed to swim in the deep. One thing we do know is that modern whales don’t wade, and when they try they become beached. Pakicetus also had nostrils, not a blowhole. So, any connection a pakicetus may have had to aquatic living can be ruled out as defining it as a whale. Pretty much the entire body of the pakicetus can be ruled out as being the reason why it’s called a whale. This seems very odd. But there has to be something that makes it a whale. What’s left? There are actually two features that are used to identify a pakicetus as a whale, the teeth and an area of the skull that encloses the middle ear. Ironically, the partial fossil skull and lower jaw fragment of a pakicetus that were originally uncovered just happened to contain the two features that make it a whale. What a coincidence. Had they found the entire rest of the body, without the two features, we may never have known pakicetus was a whale. The key feature, one that the pakicetus shares with aquatic whales, is the shape of the auditory bulla. This is the area of the skull that encloses the middle ear. If you recall, pakicetus ears were designed to hear on land, so it seems to be simply the shape of this bone (not its effect on function) and the similarity of its teeth to some aquatic whales that makes the pakicetus a whale. So if you see a huge aquatic organism swimming in the ocean with a blowhole, fins and a tale fluke, do you need to x-ray or dissect its skull to conclude it’s a whale? No, but the pakicetus demonstrates how much of difference evolutionists will allow to keep it in an evolutionary lineage. The need for transitional forms drove its classification. Evolutionism is not immune to having belief dictate the interpretation of data, thereby skewing it or distorting it in some way. The pakicetus is just one example that the story of evolution seems instead to be dependent on belief to some extent. This demonstrates that evolutionists often move outside of science to relieve cognitive dissidence and are perfectly fine with it. Even though it’s not a whale, they call it a whale and insist you put the blinders on and call it a whale as well. Posted on April 11, 2014 by Brett MIler. This entry was posted in Science vs Evolution and tagged 19th century science, belief in evolution, Darwinism, evolutionism, whale evolution. Bookmark the permalink. Great article. Thanks for posting! I love the cartoons on the whole website. Made a quick Google search and according to what I found, evolution supporters don’t claim that pakicetus went from sea-dwelling whale to coast-dwelling canine like your cartoon says. It’s the other way around. It’s not even really called a whale in the modern sense, just an ancestor. Just a heads up so that you don’t get yourself or other creationists called liars or nutjobs over a goof. Do a search on “first whale” in quotes and see what you come up with. The fact is that even though they may believe it to be an ancestor many refer to it as a whale. 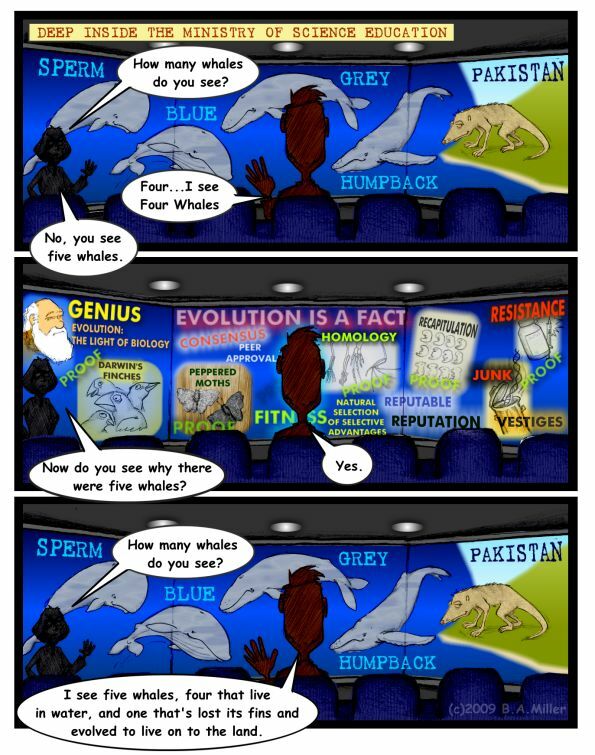 The cartoon and the text are not about the sequence of whale evolution. It’s an illustration of the Orwellian way that evolutionists play with the definitions and terms. Whales are not the only thing they do this with, but it’s an excellent example. In the cartoon’s first panel, putting the Pakicetus last was not to illustrate the evolutionary sequence, but to emphasize the gap between what most of us would recognize as a whale and the Pakicetus. The first three are obviously whales, the last one obviously is not. Yet they do call it a whale in spite of what it may actually be. 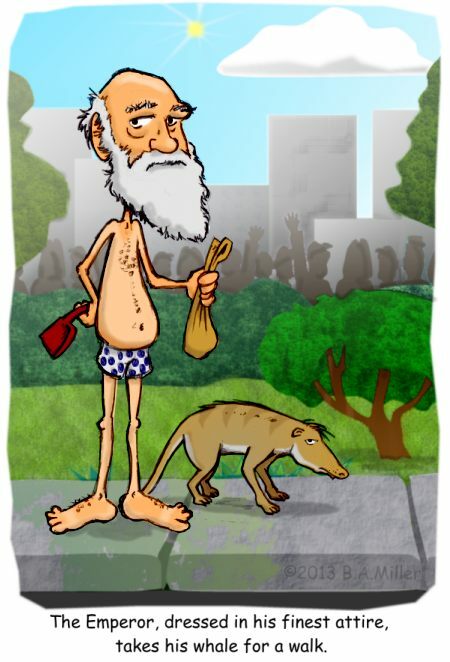 The cartoon is commentary on how evolutionists construct and present evidence, which is also the theme of the post. In the last panel, the student, who doesn’t know the whale evolution story, is succumbing to the brainwashing presented in the second panel and drawing his own conclusions. It’s not about what anybody believes about the presumed evolutionary sequence.